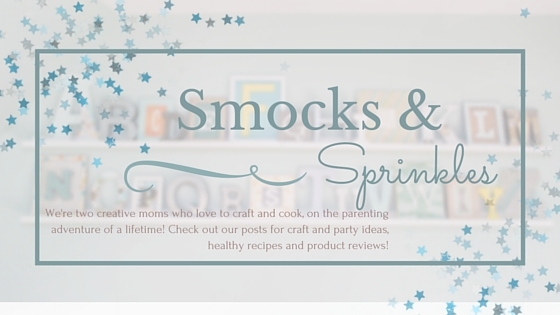 Smocks and Sprinkles: We all Scream for Ice Cream Parties! For my daughter's third birthday, we opted for a small party at home with a few of her closest friends. My daughter is obsessed with ice cream. She would eat it for breakfast, lunch and dinner if given the choice (frankly so would I), so it only made sense to throw her an ice cream themed birthday party. 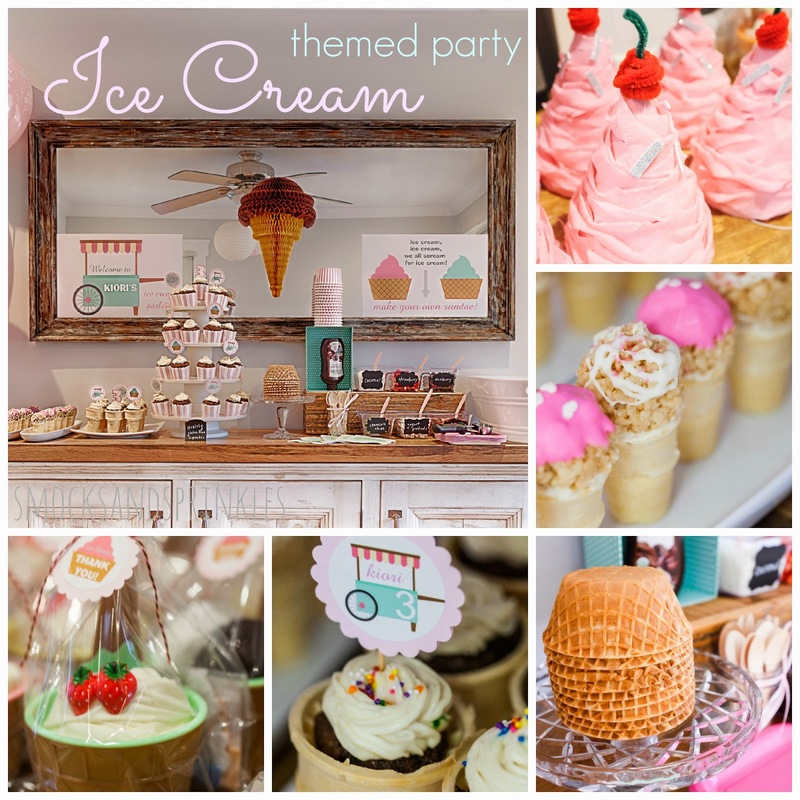 You can use an ice cream theme for any type of party really (bridal shower, baby shower etc.). We chose light shades of pink and turquoise as the main party colours. Fresh, springy and so pretty paired together. 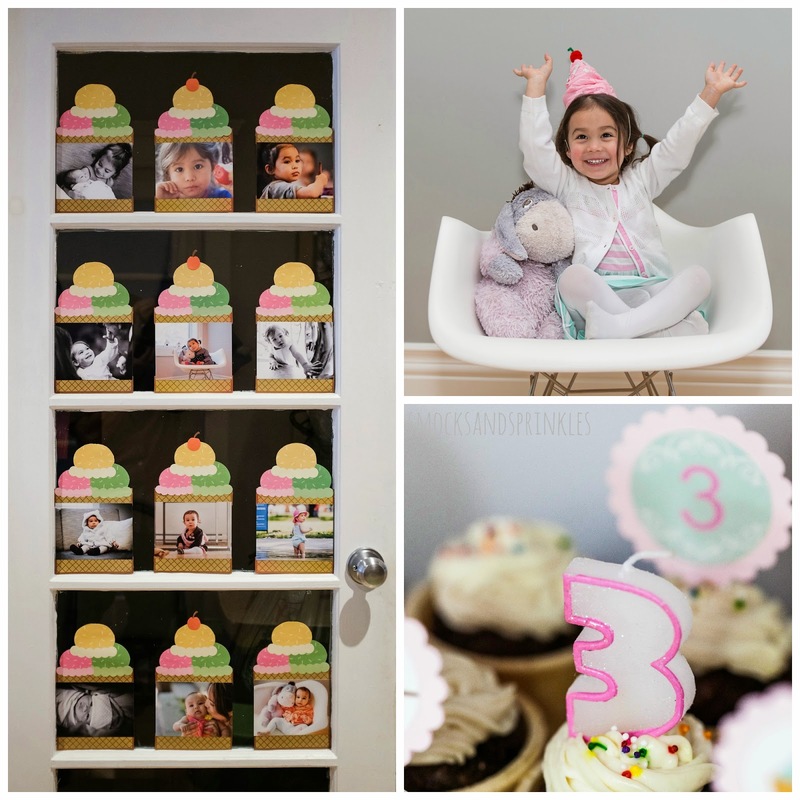 We purchased a $6 printable clip art set off Etsy and used Vistaprint services (during an awesome sale) to create fun party decor (posters and stickers). 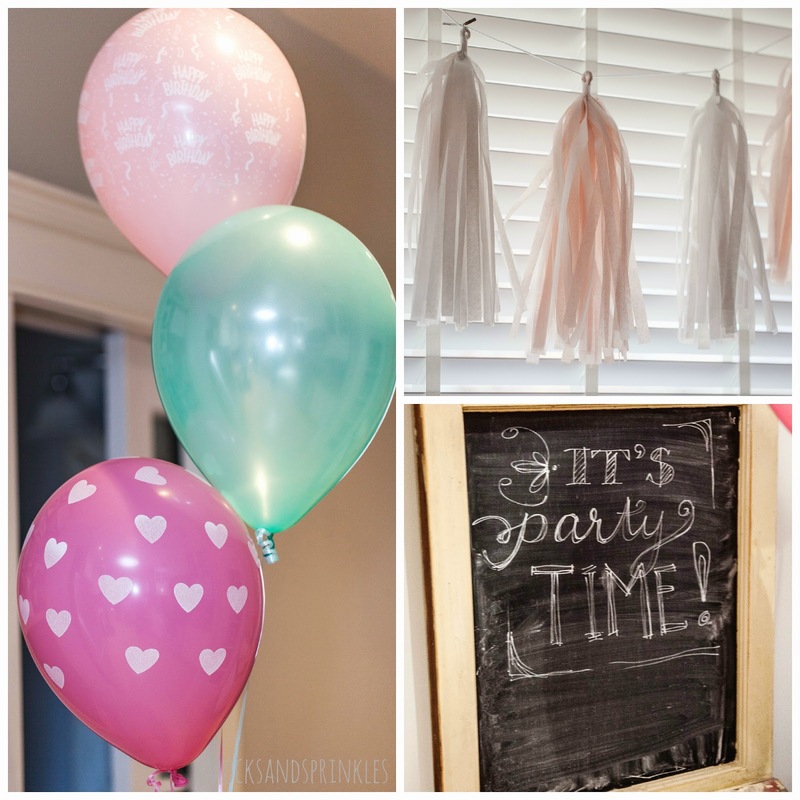 The rest of the decor was found at dollar stores (I can spend a lifetime in those stores) and online sales - check out Party Stock and Open A Party for amazing party stuff. The ice cream party hats were hand made using inexpensive materials from the dollar store. They look tricky to make but they are actually really easy! An ice cream sundae bar. I repeat. 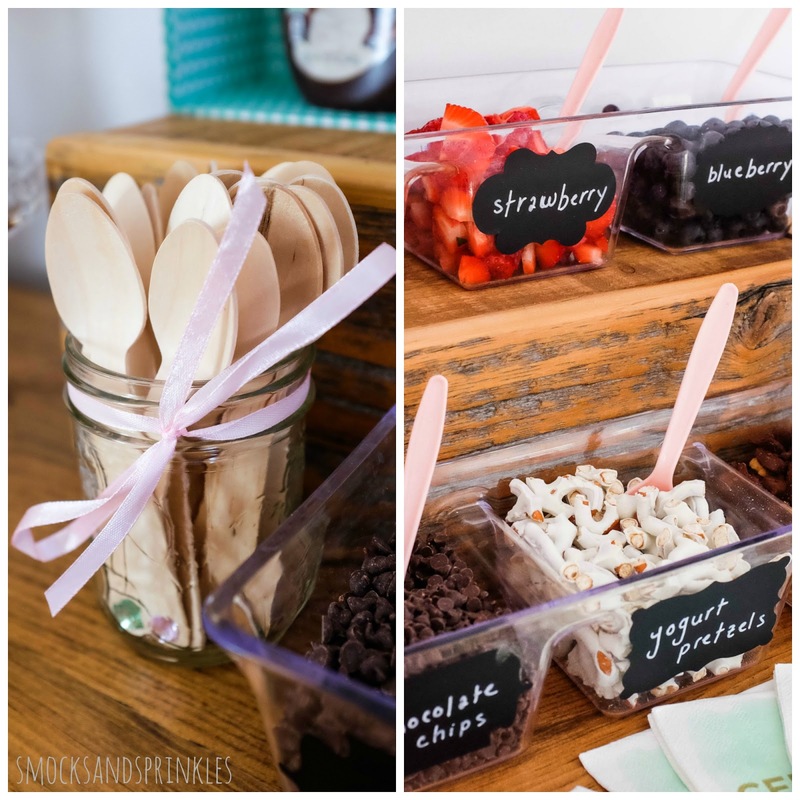 An ice cream sundae bar. 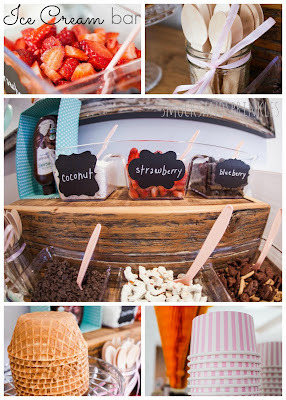 We couldn't possibly host an ice cream themed party without an ice cream sundae bar! We created a healthier version by offering vanilla frozen yogurt and toppings such as fresh fruit and shredded coconut. Okay, we also included chocolate chips and chocolate sauce...we wouldn't want to disappoint! We chose to omit nuts because of guests with allergies. You can store the ice cream in a big bucket full of ice to keep it nice and cold. 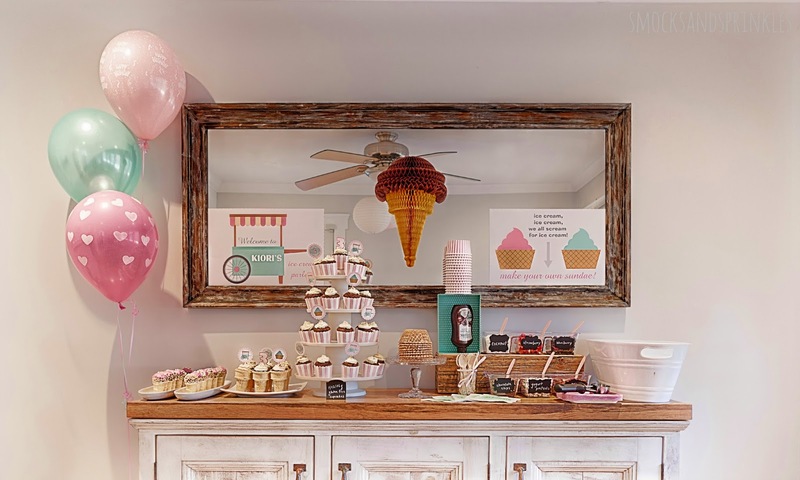 Guests could choose to enjoy their sundaes in waffle bowls or paper ice cream cups (scored these pink striped ones at the dollar store!). The 3-bowl plastic containers holding the toppings are from the dollar store. We stuck on some chalkboard stickers (also from the dollar store...I literally cheered for joy when I stumbled upon them) and wrote on them with a chalkboard marker. Yes, your eyes are not deceiving you. Chalkboard markers exist and they are pure genius! You can find them for a reasonable price at amazon.ca. And we couldn't resist wooden dessert spoons...they are so cute. You can dress them up with ribbon, jewels, stamps or washi tape. You can make them even cuter by tying ribbon around the neck of the jar. 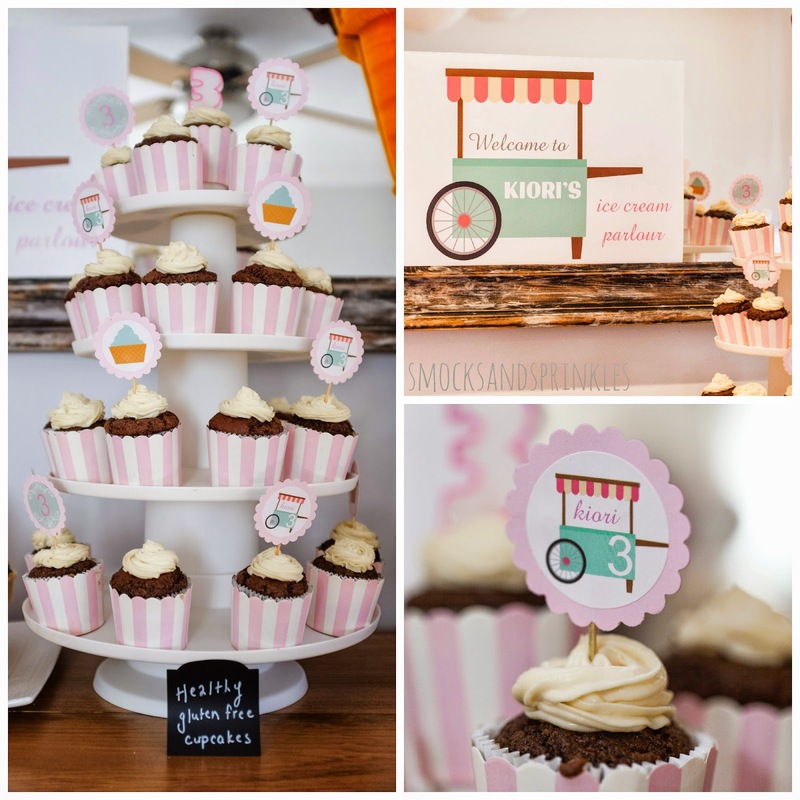 Ice cream cone cupcakes, cupcakes with paper toppers and mini Rice Krispie ice cream cones completed the dessert selection. 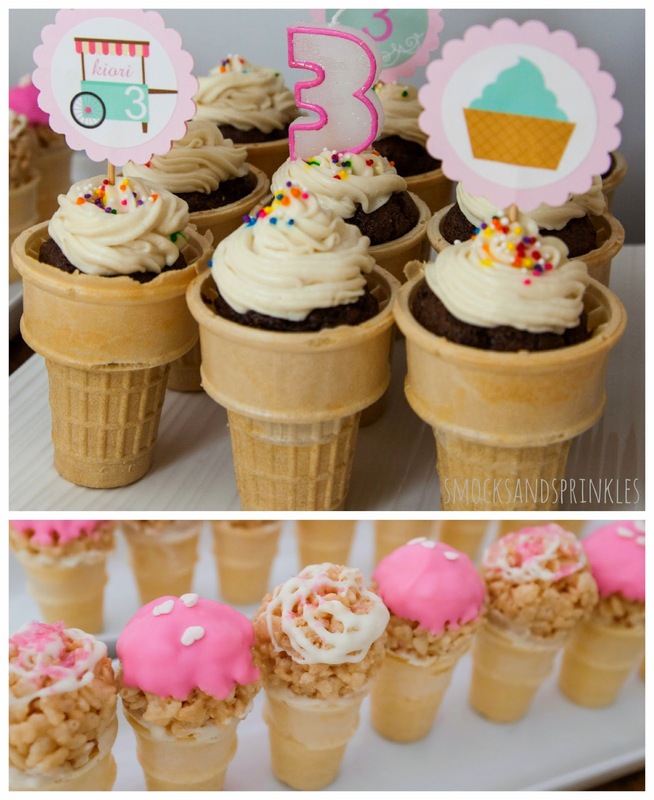 Ice Cream Cupcakes: I highly recommend serving cupcakes in ice cream cones; so easy for kids to eat (no cake cutting and plates/utensils required). You simply bake the cupcake batter right inside the flat bottomed ice cream cones (fill about 3/4 of the cone with batter). Flat bottomed ice cream cones are obviously key so you can place them right inside in the oven on a baking pan or even a muffin tin. 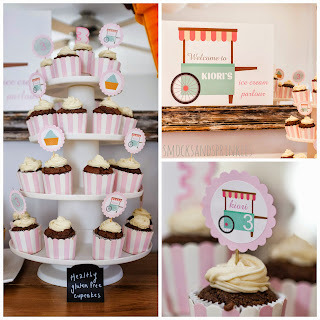 Paper Cupcake Toppers: Paper toppers are super easy to make. All you need is a scallop punch, card stock, circle shaped stickers and toothpicks. Punch out two scalloped circles from the cardstock, sandwich a toothpick in between (adhere with tape) and glue scalloped circles together (make sure to line them up neatly). Slap on the circular sticker to the front and even to the back if you want a double sided topper. Rice Krispie Ice Cream Cones: The mini Rice Krispie ice cream cones were too cute for words and simple to make. Just whip up your regular Rice Krispie mixture and then mold into little balls while it's still warm. Use candy melts to attach balls to the cones. Then decorate! You can dip or drizzle candy melt, add sprinkles etc. Candy melts comes in many different colours so you can easily match to the colour scheme of your party. You can find them at Bulk Barn and Michaels. Take home goody bags! Girls stockings in a creamy white "vanilla" colour were rolled to create "ice cream swirls" and placed inside reusable plastic dessert bowls. Strawberry hair barrettes were clipped on top for a sweet effect. Boys received ice cream scoops - socks rolled up into balls in their dessert bowls. An ice cream themed kid craft was added to each loot bag. 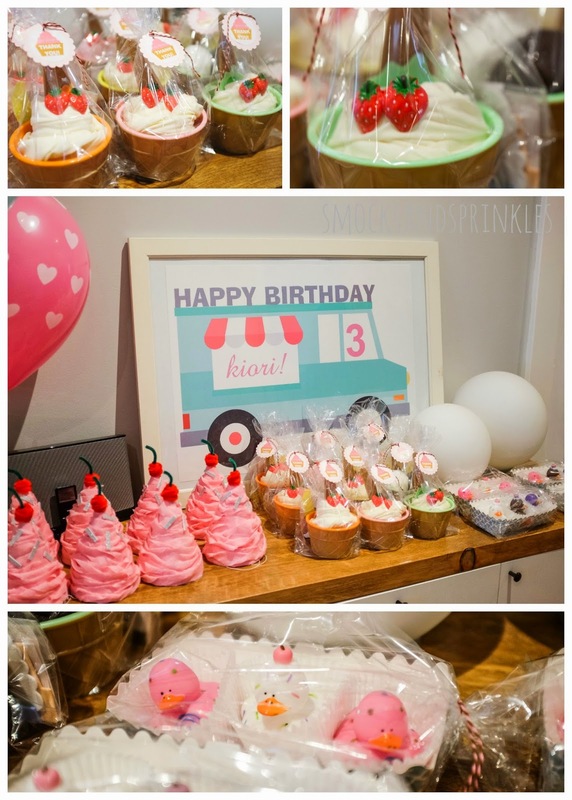 For baby guests, ice cream themed rubber duckies were placed in cupcake liners and wrapped in a set of three. A little sticker with a picture of an ice cream sundae saying "thank you" was added with baker's twine. And just so you know, I really love baker's twine. Check out our video for a tutorial on how to make your own! Tip! Get started on party shopping super early so you can catch awesome deals. You can find all your loot bag items on sale if you shop ahead of time. The food selection (sushi, mini pizzas, spanakopita, veggie platter, fruit platter, dips etc.) was purposefully chosen so that everyone could find something they liked. It's a nice idea to have some baby food pouches or jars out for your littlest guests to enjoy (no one wants to be in a room full of Hangry babies). 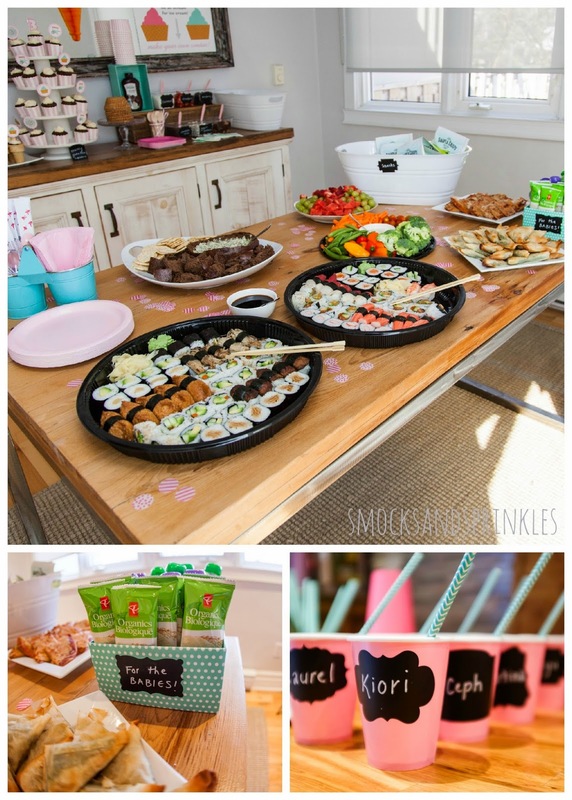 Labeled cups (those chalkboard labels are really handy) and paper straws are a fun way to serve up some drinks. 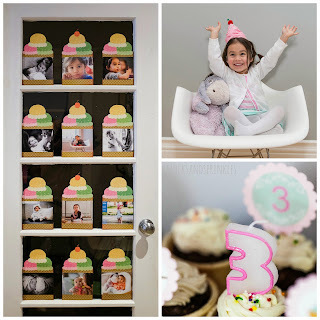 To celebrate the birthday girl turning 3, we showcased pictures of her growing up over the years. Pictures of her taken every 3 months from the day she was born were taped onto a glass door for everyone to view:) Yep, we even decorated the pics to look like ice cream sundaes. Planning a kids party? Let us help! We are full of crafty ideas. Did you just throw an amazing party? Share your ideas and photos with us. We love to see your creativity at work! Wow...Great idea!! 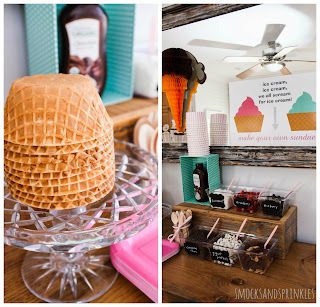 Perfect party arrangements and I liked this Ice Cream Party theme. Last year, we had a party at one of the finest event locations in Chicago with my friends. This time we are also planning for a theme party and I think we should go with this theme. Thanks! The weather has been perfect for an ice cream theme party. Let us know how your party turns out!